OTTAWA—Conservative leader Andrew Scheer and NDP Leader Jagmeet Singh are calling for an ethics probe into allegations the Prime Minister’s Office pressured former attorney general Jody Wilson−Raybould to help SNC−Lavalin avoid a criminal prosecution. 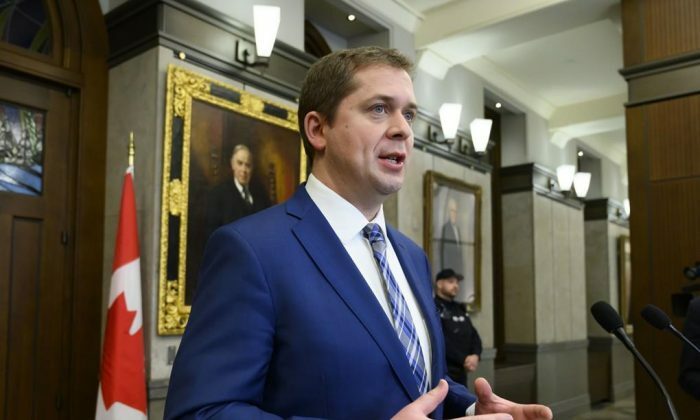 Conservatives on the House of Commons justice committee, along with the New Democrats, will also force an emergency meeting to consider a motion calling on nine high−ranking government officials to testify on it, Scheer said. The list includes Wilson−Raybould herself, Justice Minister David Lametti, the prime minister’s chief of staff Katie Telford, and the prime minister’s principal secretary Gerald Butts. The Globe and Mail reported on Feb. 7 that Wilson−Raybould was demoted in a cabinet shuffle early last month because she wouldn’t intervene in the case of SNC−Lavalin. “All this cries out for some serious investigation,” Singh said in a telephone interview from Burnaby, B.C., where he’s campaigning for a seat in the House of Commons in a Feb. 25 by-election. The Globe reported that PMO aides leaned heavily on Wilson−Raybould to persuade the federal director of public prosecutions to negotiate a “remediation agreement” with SNC−Lavalin as a way of holding it to account for wrongdoing by some of its executives, rather than pursuing a criminal prosecution that could financially hobble the company. SNC−Lavalin was charged in 2015 by the RCMP and openly called for a remediation agreement to avoid damaging the company, a major employer in Quebec. After lobbying by the company of government officials, including those in the PMO, the government included in its 2018 budget a Criminal Code amendment to allow such agreements to be negotiated in cases of corporate crime, as is done in the United States and the United Kingdom. Last October, Kathleen Roussel, the director of public prosecutions informed SNC−Lavalin that negotiating a remediation agreement would be inappropriate in this particular case. Three months later, Wilson−Raybould was moved to the veterans affairs post, a move widely seen as a demotion. Singh said the allegations suggest there may have been possible violations of three sections of the federal Conflict of Interest Act: the prohibitions against public office holders giving preferential treatment to any individual or organization, using insider information to improperly further a person’s private interests, or seeking to influence a decision to further another person’s private interests. That left her successor at Justice, Lametti, to fend off opposition charges on Feb. 7 of political interference in the justice system. Lametti said neither he nor Wilson−Raybould were ever directed or pressured to intervene with the director of public prosecutions to drop the prosecution of SNC−Lavalin. SNC-Lavalin Group Inc. increased its presence in the booming global oil and gas industry with its $2.1 billion acquisition of U.K.-based Kentz Corp. Ltd. on June 23.